case study Tech News What is the 811 number of Kotak Mahindra Bank? Considering the digitization process of the government, almost every bank is heading towards the Digital Savings Account. Kotak Mahindra Bank has also come in this list. Under which 811 savings accounts have been launched. Since its arrival, the customer will no longer need to stand in line with the bank. Nor will it require any KYC procedure since its arrival. 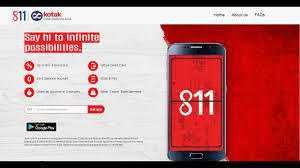 How to Open 811 Savings Account 811 Savings Account First you need to download Kotak Mahindra Bank Mobile Banking App. It is important that you install this app by visiting the Play Store in Android phone. Once the app is installed, then start the process of opening the account, it will have to click the link. After this, the registration process has to be completed, such as information about PAN and Aadhaar card details. After that, the opening of the account will be almost complete and details of your account details such as account number and CRN will be prepared. Later, you have to set up a PIN for mobile banking to start banking activities on an immediate basis. Eligibility Criteria It is worth noting that 811 Savings Account can be opened only by those individuals who currently do not have any bank account with Kotak Mahindra Bank. You must be 18 years or older to qualify for it. At the same time, you are a citizen of India and India has proof address such as PAN and Aadhar card. Features In this savings account, you can earn 6% interest P. If your account has the balance of Rs. 1 lakh to Rs. 5 crores then. The interest of 5 percent pa on the balance up to Rs 1 lakh will be payable. So, 5.5 percent interest will be paid to the account holders every year on the amount of more than Rs 5 crore. This bank account opens with zero balance, there is no bound procedure for keeping the minimum amount. Online fund transfers like IMPS, RTGS and NEFT are completely free. Virtual Visa Debit Card offered with the account can also be used in business outlets as well as online transactions.